It will take some time, patience and practice to master Adobe Photoshop. But, there’s no time better than the present to roll up your sleeves and whip up some basic designs to get your feet wet. The interface and terminology might be intimidating at first, but when you boil things down and use Photoshop’s tools in bite-sized portions, you will be amazed with how quickly the software becomes familiar to you. Also, feel free to learn more general information about Photoshop and Adobe Creative Suite in our September blog. If you feel more like a fry cook at McDonald’s than Mario Batali at the end of this exercise, that’s okay. Like cooking, a big part of becoming better with Photoshop is to experiment. When you feel like you are in over your head, remember: You can burn food, but Photoshop has an undo button. Today, we will use some of the most popular ingredients designers use in Photoshop. After getting comfortable with using these elements, you will be ready to start learning more about Photoshop’s pantry of creative tools to create amazing designs. For more in-depth tutorials and guidance, we are constantly holding Photoshop workshops and we would love to hear about what you want to learn. 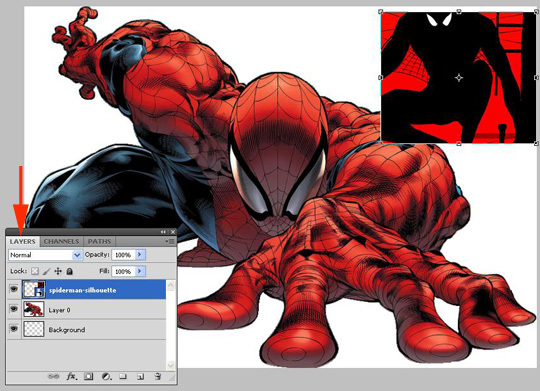 To open an image, such as a photograph (or in this case, a Spider-Man cartoon), simply click File>Open. This opens a box for you to locate an image on your computer and open it in Photoshop. Using Open will always open an image as a new document. If you want multiple images in a single document, use either File>Place or File>Import to open new materials within your current document. Tip: The Place function has function that lets you transform (resize and rotate) an image by clicking on the edges and dragging (or rotating) the image to a desired effect. Once done transforming the image, click Enter. When opening multiple files in one document, there is a strong chance that one image will overlap and hide the other. Don’t worry. You can easily rearrange images using the Layers panel. Think of each component of your document (image, text, etc) as a layer of cake. Components within your document are layers “stacked” on top of each other. The order of these layers can be viewed and managed in the Layers panel. 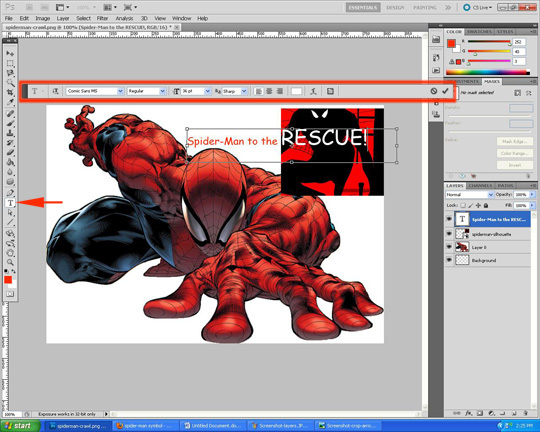 Looking at the image, you will see that the Spider-Man silhouette graphic (in the top-right corner of the document) overlaps the other Spidey graphic. This hierarchy is replicated in the Layers panel. 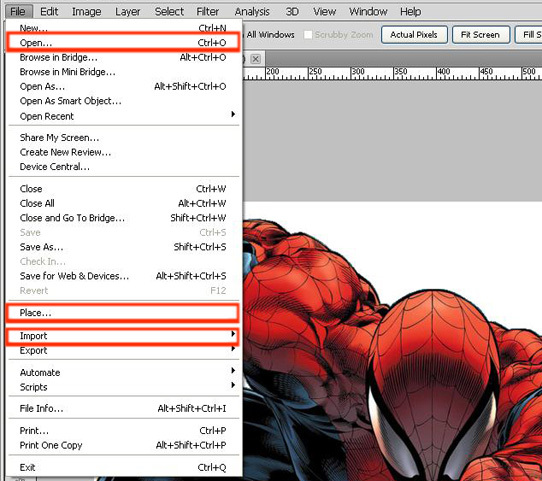 To rearrange layers, simply click and drag items in the Layers panel. Tip: You can never rearrange the order of the “Background” layer. Unless you have a single-layer document, avoid using materials as the background. Sometimes, there’s just too much food for the table. If you have too many things open in your document, clicking on the “eye” icon in the Layers panel will make a layer invisible. To bring it back, simply click the box again. Presto! Managing layers effectively is perhaps the most important part of learning Photoshop. By using icons in the Layers panel or navigating through the Layer menu in the main toolbar, you can quickly duplicate, delete or create a brand new layer to work in. These are basic, vital Photoshop functions. Tip: Always remember to check which layer is selected in the Layers panel before doing any work. If the wrong layer is selected, you are bound to get frustrated. Don’t worry, this happens to everyone. Like slicing off the top of strawberries or extra dough off the side of a pie, trimming away undesirable content so your image has only the best bits is a simple matter of using the Crop tool. To crop an image, simply click on the Crop icon, then click and drag the mouse to create a grid of the content you wish to keep. 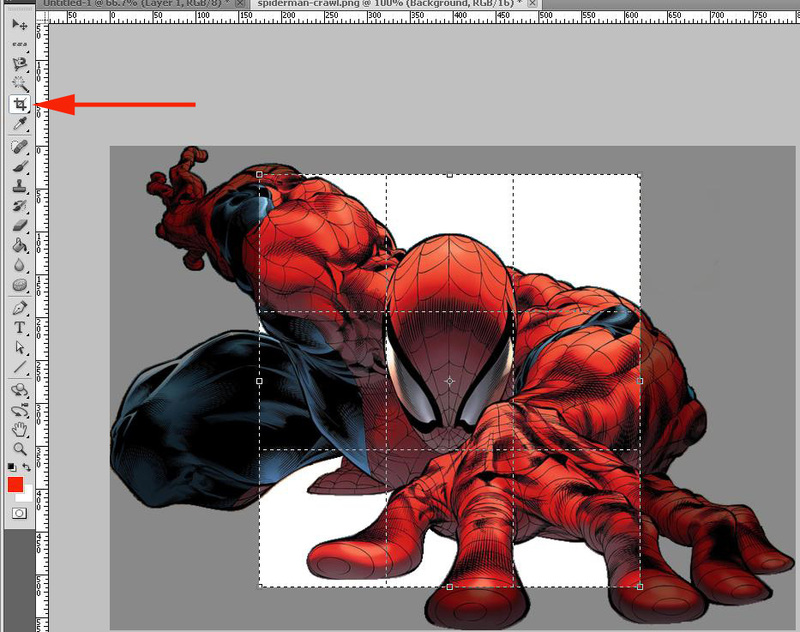 Lifting your finger from the mouse will set the grid, but it won’t automatically crop the image. You can continue to perfect your cropped area by playing with the borders, using the hollow boxes at the edges of the grid for adjustments. Hitting enter chops out any content outside your grid. For more advanced trimming, take a look at our Lasso tool blog. If an image is too large, use the Resize function to shrink it. Click Image in the main toolbar, then scroll to “Image Size.” This opens a dialogue box where you can see the dimensions of the image. The dimensions are always displayed in pixels (not inches or other common measurements). To resize the image, click on the Width or Height box and fill in a desirable figure. Tip: Making an image smaller won’t affect the image quality, but enlarging an image will create undesired pixilation. To avoid this, always use a large file as your source material and work off of a copy of your source material. Using cool graphics with text is like pairing red wine and a well-cooked steak. They just go together. To write text in your document, click the Text tool in the tool palette. Then you can create a text box and use the Text panel to tinker with text styles. Simply click and drag the mouse to create a text box. Click within the text box and type away. You can use the Text panel to adjust font size, style, color and orientation. The text box becomes a layer that you can play with just like any other layer. Perhaps the best advice we can give is to save your work early and often. Your Photoshop graphic won’t spoil if left out, but it might get lost like food that falls under the refrigerator. We promise you, losing your work is far more frustrating.